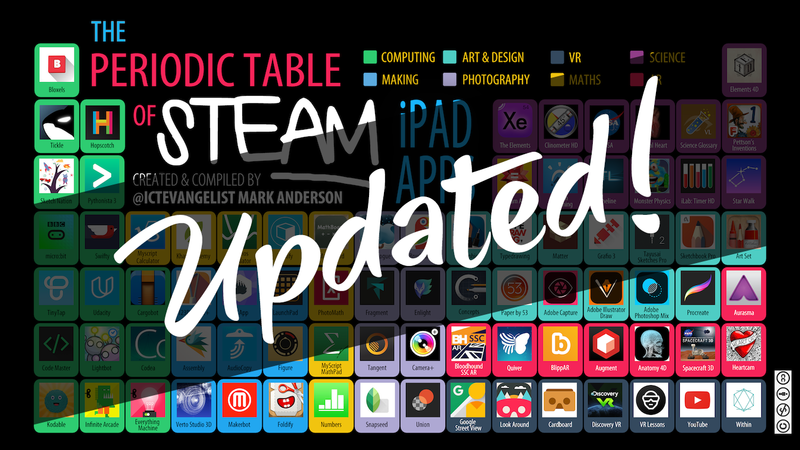 Back in early July I created the periodic table of STEAM (that’s Science, Technology, Engineering, Arts and Mathematics for those who think I’m full of hot air) apps in the same format as my previous two periodic tables. This time the various sections were different to what I had and based around different areas of ‘STEAM’. When I made this one (and the previous one too) I had meant to put them both on ThingLink and then add links to all of the different apps to the images. It was one of those things that ends up on your ‘to do’ list but you never actually get around to. I was contacted recently by Wendy Torres from Baltimore, MD via my website who asked if she could do exactly what I had never actually got around to and link up each and every one of the 82 apps on the table. She has now very kindly done that and shared it with me on Twitter. I now share it with you too. My thanks to Wendy for taking the usefulness of the resource one step further. Thank you! The Periodic table of STEAM APPS with hyperlinks #Steam #edtech https://t.co/doe0TrgExe Thanks@ICTEvangelist for creating the original work.